This month, you can win a Radford Bright Cheese Knife Set, courtesy of our friends at Robert Welch, the flagship designers of fine knives, cutlery, tableware, cookware and homeware. This is an original gift for any cheese lover, as this set of three hollow handled cheese knives will make a truly outstanding addition to any cheese board. 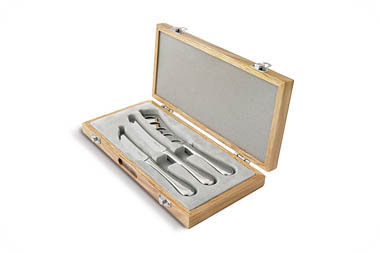 Beautifully presented in an oak veneered box with a grey velvet look interior, the set includes a hard cheese knife, an all-purpose cheese knife and a soft cheese knife - all from their timeless Radford range. With a mirror-polished finish and expertly crafted from high quality specially hardened stainless steel, they are dishwasher safe and come with a 25 year guarantee. "Which three UK counties are licensed to produce Blue Stilton"?